March is named for Mars, the Roman god of war who was also regarded as a guardian of agriculture and an ancestor of the Roman people… In Finnish, the month is called maaliskuu, which is believed to originate from maallinen kuu, meaning earthy month, because during maaliskuu, earth finally becomes visible under the snow…. We have been getting a lot of rain, too. Our weather systems are related, as I always see when I look at the weather map of the Pacific. We have some deciduous trees that are budding, too! Are those flower buds or leaf buds? Hattie, yes, the weather folk say this is another Pineapple Express, worse than the last one because it’s lasting so long, almost a week now. 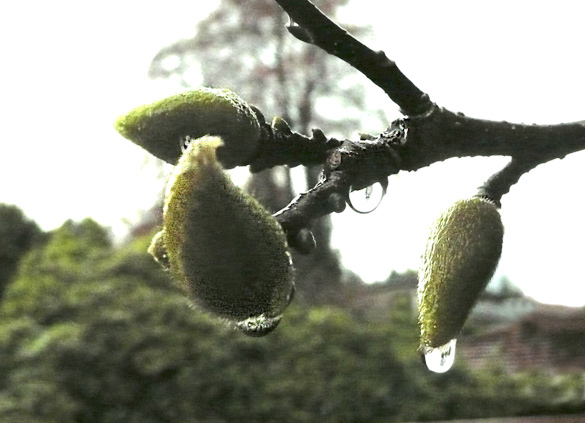 These are magnolia flower buds, which come out before the leaves. Leaf buds are emerging in various deciduous shrubs and trees. Those are wonderfully lush looking buds you have there but I’m sorry to hear you’re still having so much rain. Not that things are much better here yet weather-wise. There have been enough above freezing days to melt most of the old snow but still very few sunny ones. Today it snowed again – all day. Still, it’s almost official spring and it’s pleasant having the extra daylight, isn’t it? Susan, sorry to read you’ve had snow again. I should not complain of rain for that is life on the west coast (wet coast, we say) and it doesn’t have to be shovelled! It’s just too much of it this week. Yes, the extra daylight is indeed lovely and when we do have the sunshine it is brilliant. Spring is here. you wrote this entry on March Idus. That day 44 b.C. Caesar was murdered. And was supposed have been said: Et tu, Brute! It’s very cold nights and freezing days even here. And yet in South, Helsinki region. One of the longest winters I remember and I remember winters quite well at least for 60 years here. Weather forecast promised colder yet starting tomorrow. I will be brave and take my ordinary march thru the city, go to my swim gym and march back and NOT get sick, but probably more able to take this everlasting cold. Marjatta, I had forgotten about the Ides of March, as we call it here. There was much to-do here about St. Patrick’s Day on the weekend. I’ve noticed how cold it is in Finland, and many parts of Europe, brr. Hope it warms up soon! Here the sun finally came out yesterday after a monsoon lasting nearly a week. I was shocked to see the snow line on the mountains is quite low, but I’m sure it makes the skiers happy that the snow was not washed away. So don’t envy us too much except when the sun shines and it is almost 12C like this afternoon, but with a very cool breeze. I don’t usually mind it, having gone soft (and green with moss between my toes) having lived here for four decades. It has snowed all night and most of the day so far… I like to think that the earth will again become visible soon! Marly, oh dear, sounds like the same storm that hit Ontario and Quebec. Of course you are just south of there. Winter is sure stubbornly hanging around too long. Stay warm!